For the last race of the 2013 season, we're experimenting with a new Factbyte Factbox idea. Here we'll cover all the important information, links, tweets and more that you'll need to know across the entire race weekend, with a bit of context littered in between. The FBFB will still be in action for the race directly, but here you'll get a good overview of the action (or lack of it) from Brazil. With rain scheduled for the entire weekend, who knows what will happen as drivers fight for the best possible result from the final F1 event of the year. Hello there, welcome to a new concept in Factbyte Factboxing in which we guide you through the entire F1 weekend from one handy location. Expect tweets, updates, links and more as the weekend gradually unfolds. 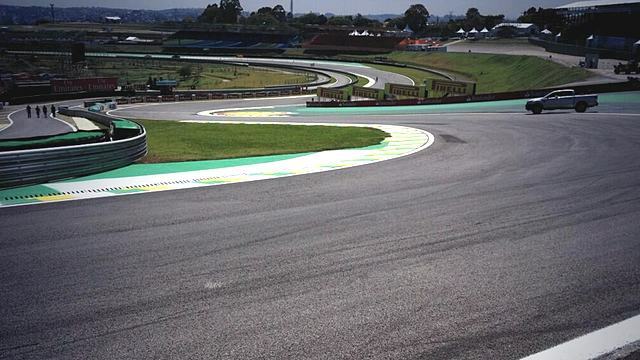 Tweet from @MyCaterhamF1: Thursday in Sao Paulo means it's the official first day of the last race of 2013 so we start by saying BOM DIA BRASIL!!! Mark Webber heads into his final F1 race this weekend. He'll be looking for a strong finish, maybe even a win, to wrap up his F1 career in style. He's also got just two points between him and the rapidly falling Kimi Räikkönen in the standings. But he's also the unluckiest driver potentially on the planet. So, what do you think? How will Mark Webber's final race weekend pan out? It's also Felipe Massa's last race with Ferrari, before he moves to the Williams team next year. It's the end of an era for the Brazilian, and he's finishing his career with the Scuderia at his home race as well. In the press conference today - Felipe Massa: "I think Ferrari is a dream for all the drivers. I remember, one of the first go-karts I had was red. My first overall was red, so I was always supporting Ferrari as a kid. So racing eight years for Ferrari is definitely a dream come true. So, getting old as well! But also it's another re-start for my career. I'm really happy and looking forward to my future in Williams, a different team. 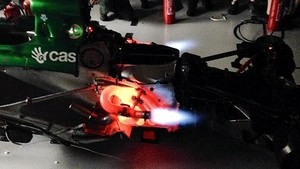 So really, a lot to do still in Formula One." Two free practice sessions await our drivers tomorrow, but the weather forecasts are not looking too kindly on F1 at the moment. Showers for most of the day, I think. Here it is, Free Practice day has arrived and the drivers are scheduled to complete three hours of running. Pirelli have brought the hard and medium compounds this weekend, and they've got some of next year's tyres for testing as well. It doesn't look like they'll get much running, however, as the rain is coming down in Brazil! Three Friday drivers are in action in FP1, with Rodolfo González in at Marussia, James Calado in the Force India, and Daniil Kvyat for Toro Rosso. It was a wet first practice session, with the Mercedes pair topping the times and Sebastian Vettel third fastest. The wet and intermediate tyres were in action, with no sign of Pirelli's test tyres for next year. The session was mostly incident free, despite the tricky conditions. There were a few more spins during FP2, and less laps completed overall. No driver did more than twenty circuits of the very damp track. Nico Rosberg has led both sessions of practice in the damp conditions, and it looks like the Mercedes and Red Bull cars are the ones to watch. There was a lot of tyre-saving in that second practice, though. Tweet from @SutilAdrian: What a rainy day at the track today! Tweet from @maxchilton: First time I have driven Interlagos and its a fantastic short and technical circuit. Have only driven it in heavy rain but loved it! There's just one final hour of practice left to go, and guess what? It's raining at Interlagos! Shocker, I know. Teams will still want to be saving their tyres, but if it's going to keep raining all weekend, a bit of practice in the damp wouldn't go amiss. It was very wet out there again for final practice, with four drivers not bothering to set a time. Jenson Button only did one installation lap and hid in the garage for the rest of the session! 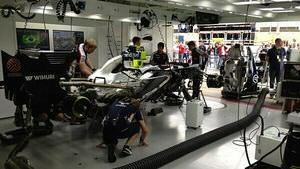 Williams get to work, via @dickiestanford. Bottas finished fourth in that final session, and did very well in the US. At the last race, Williams' points total rocketed to five. What can they score this weekend? A big happy birthday to Ross Brawn, who celebrates his 59th birthday today. His is another future that is under speculation, likely to be leaving Mercedes at the end of the year. Pat Symonds was asked to give a presentation on innovation for the GREAT Britain campaign this weekend. Can't believe that's still running, Amy blogged about attending a related event back in March. March 2012 that is. Well that was a long old qualifying session! The rain saw a big delay between Q2 and Q3, but we got there eventually! Sergio Pérez had a big crash in the second session, but climbed from the car unharmed, and later said it must have looked worse than it was. Weirdly, Pérez still managed to finish ahead of Jenson Button, who really wasn't enjoying himself out there today. Or this year. Tweet from @EliGP: Vettel says he is surprised. I think he hasn't been following F1 lately. In not-quite-penalty news, Max Chilton and Esteban Gutiérrez have gotten reprimands for crossing the white line in the pitlane entry, occurring in one of the practice sessions. Marussia have also been fined for releasing Max Chilton into the queue at the end of the pit lane during qualifying. The Brit butted the nose of his car into the queue, instead of lining up properly. Not very British at all! Don't forget you can make your predictions on what will happen tomorrow. Will it rain? Will we see the safety car? Who will be the first spinner? Who will win... no, scratch that, we know that one. It is party central on Saturday in Brazil. Hülkenberg shared a selfie from his team dinner, while the damage Pérez caused earlier in the day didn't delay his team in joining him for one last meal. 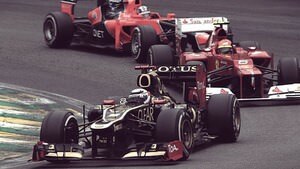 Talking of Hülkenberg, the German site Auto, Motor und Sport are claiming Nico will be returning to Force India for the 2014 season. F1 cakewatch. Sutil's partner Jennifer Becks celebrated her birthday yesterday in Brazil with this dazzling little number. Button also scored cake for the slightly random achievement of making it to his 247th Grand Prix this weekend. His start later today will see him pass David Coulthard as the most experienced British driver in F1's history. Watching Ted's qualifying notebook (UK only), Kravitz notes that Caterham are the first team to present their 2014 chassis to the FIA for crash testing purposes. Also look out for bonus Van der Garde around the 16 minute mark. F1's extended qualifying session yesterday raised yet more questions about the sport's inability to run in anything but ideal conditions. Mark Webber has no qualms about the delay though, "I’m not bothered about people at home. We’ve got to make the right decisions for us here." Pirelli tyres are under much scrutiny again, but this time it's the wet tyres coming under fire. The full wets are apparently not handling the damp conditions in Brazil too well, but Pirelli say it's because they haven't had an awful lot of wet testing. I thought Xevi Pujolar from Williams had the best comment, though: "I think we need to do some development with the wet tyres, but that costs money. If there was a tyre war, you would need to do it because if the other tyre can do it, you need to do it. But now you can say wait 10 minutes and it will be fine." Tweet from @McLarenF1: On this day 7 years ago @LewisHamilton was confirmed as a McLaren #F1 driver. 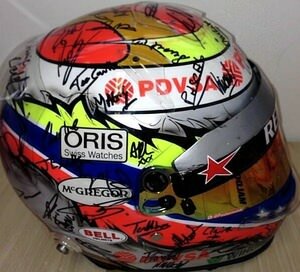 We’ll never forget Interlagos '08. Good luck today, old mate. Lots of group photos pouring in from Brazil, this one "The Class of 2013" from @therealbatchf1. Tweet from @clubforce: Amazing how quickly this season has gone. Always a "last day of school" feeling in the paddock when the season ends! Tweet from @radarguruf1: #F1 race day #Interlagos: O'cast, but dry for the next hour or two. Chance of storms developing during the race. Light ESE breeze, max 25c. Pastor Maldonado does that end-of-term thing, by getting all his classmates to sign his shirt. Or the F1 equivalent of that, anyway. 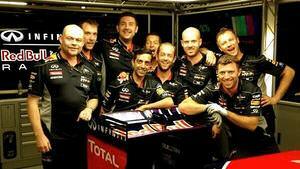 Via @WilliamsF1Team. Sebastian Vettel wins the Brazilian Grand Prix. Be sure to enjoy Sidepodcast's lap-by-lap live text highlights. Check out all the post race round up information in the shape of race results, driver standings, and team standings. Tweet from @McLarenF1: Interesting stat #1: McLaren is the first F1 team in history to have both cars classified at every race of the season! 885 laps in the lead of a Grand Prix. New issue of GP+ is out, just three hours after the race. Alonso has hinted that had Massa been behind him at the end of the race, he would have let his outgoing teammate take the final podium position. Kovalainen admits he misjudged the challenge of replacing Räikkönen for two races. "The amount of errors I made is more than I anticipated and I have to admit that maybe it was too big a challenge and I underestimated it." Red Bull's post-race team podcast is available for your listening pleasure. 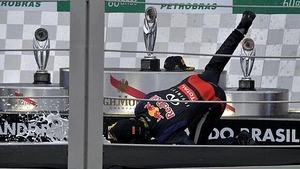 Mark Webber shared this brilliant picture of his podium slip up on Twitter. Do you feel like you haven't quite had your say on the race yet? Luckily, our last Rate the Race post of the season has just arrived, so get voting now! And if you need any help with the Driver of the Day poll, regular feature writer Adam has rounded up who he thinks deserves a merit for their conduct in Brazil. That about wraps up our coverage for Brazil. Thank you for following along with this logbook trial, it's been a lot of fun and hopefully a bit of use as well.